I get them, I make them. Trigeminal neuralgia – for those affected this means violent unilateral facial pain. Not infrequently, it is accompanied by depressive moods. Chiropractic interventions promise quick relief without side effects. Experts criticise this approach. Opening the mouth while eating and speaking, and even accidental contact on a particular face area, is enough to trigger pains which are among the strongest that one can imagine. These attacks can last up to two minutes and occur up to a hundred times a day. Often the pains occur without warning, sometimes they announce their presence with burning, itching and tension sensations in the face. Between these attacks however those affected are free of symptoms. These so-called remission phases can last for months or years. However, these pain-free time periods are often shorter, the longer the disease has progressed. Attack-type, “classic” trigeminal neuralgia is not triggered by brain tumours, multiple sclerosis or stroke as are some other forms of facial pain. 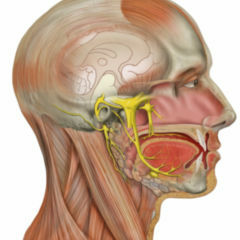 It is thought that the pain of a “classic” trigeminal neuralgia arises when blood vessels have direct contact with the nerve and exert pressure on it. This damages the myelin sheath that surrounds the nerve. According to Prof. Dr. Steffen Rosahl, one of two consulting neurosurgeons working in a collegial system at the HELIOS Klinikum Erfurt (Germany), pressure is probably not necessary to trigger a “classical” trigeminal neuralgia. “It’s base cause is more likely a conflict between blood vessels and the trigeminal nerve, precisely on the brainstem, ie where the protective myelin sheath does not completely envelope the nerve”. There probably exists a connection between the nerve and the vascular system, in which a direct leaping over of an electrical excitation occurs, he says. The medications of choice for treatment of “classical” trigeminal neuralgia are anticonvulsants, especially carbamazepine and oxcarbazepine. “The treatment brings with it ever present problems when higher antiepileptic levels are required with patients of advanced age, and among those affected side effects such as drowsiness, balance disorders and hyponatremia occur. That aside, the treatment of trigeminal neuralgia is standardised today and highly effective”, says Dr. Axel Heinze, chief consultant of the Kiel Pain Centre (Germany). And in the event that the medications do not work (any longer), or the side effects are too severe, operations (eg. microvascular compression as per Janetta) can be considered – this is the recommendation from the German Society of Neurology. However, the German guideline – even 40 years after Peter Janetta published, and thus gave the world, his causally explanatory contribution to the clinical picture for this condition – was put together without the participation of neurosurgeons. “That’s a shame, because the official recommendations for patients have the potential to bring suffering, which is something preventable”, Steffen Rosahl offers as food for thought. In his opinion, the treatment of classical trigeminal neuralgia – as with all diseases in which this is possible – should primarily focus on its causes. “The microvascular conflict, which leads to an ephapse, ie. a faulty electrical transmission between the blood vessel and the trigeminal nerve, should be eliminated microsurgically. With “classic” trigeminal neuralgia, the success rate is over 90 percent. The pain already disappears on the day of surgery – drugs are then no longer necessary”, Steffen Rosahl adds. Treatment failure are often caused by misdiagnosis, and among patients with multiple sclerosis the success rate is dramatically lower. If surgery does not appear a realistic option, (destructive) radiosurgical treatment could also be offered; percutaneous procedures used on and in the gasserian ganglion are, however, no longer indicated with “classical” trigeminal neuralgia. Chiropractic with trigeminal neuralgia as well? Yet again and again doctors have come to learn that patients are looking for alternatives. This is because every surgery carries the risk of complications and every drug has side effects. The topic that then frequently arises is chiropractic. Articles on this issue also raise hopes among those affected. According to a publication in the magazine produced by the non-profit organisation Facial Pain Association, patients are said in a few sessions to be pain free – and without risk of complications and without adverse effects. 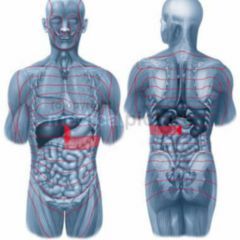 The explanation: shock trauma of the head, neck and upper back can alter the position and orientation of the top three cervical vertebrae – especially the atlases. Almost all information which is sent from the brain to the body and back needs to pass the atlas. The core of the trigeminal nerve also extends through the entire brainstem up into the upper spinal cord. According to author and chiropractor Larry Arbeitmann, the pain associated with trigeminal neuralgia may not only be triggered by injuries of the nerves in the face, but also through damage in the central trigeminal system. This is located in the upper spinal cord and the pontomedullary system in the brainstem. Shock trauma is therefore able to injure nerves, whereby trigeminal neuralgia can develop at the end of the nerve fibres in the face – at once or over several years. At least this is what is stated in the Facial Pain Association’s publications of its magazine. However specialist chiropractors are said to be able to correct or “adjust” these disturbances and displacements of the upper cervical vertebrae. Some treating therapists use only their hands in doing this, others use various instruments, still others supplement the treatment with electrical stimulation or cold or heat treatments. During treatment, the patient should feel only mild vibration or tapping, high pressure or force are not desired. “The adjustment of the upper cervical vertebrae should feel as if a nurse were measuring the pulse”, says Larry Arbeitmann. To date, no clinical trials have been published on the subject of chiropractic and trigeminal neuralgia. Nevertheless in the article a pilot study from 2000 is presented, in which eight patients with trigeminal neuralgia are said to have participated. After the first spinal adjustment, with two of the participants the ailment disappeared and no longer occurred over the following eight weeks (the duration of study). With the remaining six patients, the symptoms improved within the first four weeks by an average of 70 percent. Any search for the sources of the study end in vain. Larry Arbeitmann writes further that his and his colleagues’ experience show that 73 percent of a total of 68 treated patients with trigeminal neuralgia were free of pain. With 21 percent of the patients the symptoms improved, and with only six percent was chiropractic unsuccessful. Chiropractic – yes or no? Chiropractic interventions for trigeminal neuralgia are of no importance, says Axel Heinze. Nerve pain arises when the trigeminal nerve is either damaged by pressure or trauma or inflammation, he says. It cannot be influenced by manipulation, he says. The problem with the article is also that it does not distinguish between facial pain and trigeminal neuralgia. “[…] The reader/patient (is) left in the belief that each of the promoted measures would be appropriate to treat any facial pain. Manipulation of the cervical spine can influence cervicogenic headache, which can manifest itself in facial pain. For trigeminal neuralgia it is completely pointless”, explains Axel Heinze. Neurosurgeon Steffen Rosahl sees it similarly. Some forms of atypical trigeminal neuralgia can perhaps respond to chiropractic procedures. “In general, one must also say that these patients often also suffered because nobody could improve their pain before they found the chiropraxis, and thereby nobody had given them any more attention and compassion. In this respect there is considerable mental potential present in association with treatment”. Chiropractise for Trigeminal Neuralgia? Are You kidding me? It is not serious, Please after so much progress in diagnostic and neurosurgical progress! I will be in thouch for further discussions, and ready for sharing experience! An interesting article but not a mention of a really efficacious treatment for the condition: botulinum toxin. This has revolutionised the treatment of TGN and there are many clinical trials showing the benefits. The use is still off-label, but no review of treatments for the condition is complete without including this molecule.